Qualcomm today announced the Snapdragon 450 Platform, a new entry in its mid-tier range of processors for high-volume devices. The Snapdragon 450 is the first 400 series chip to make use of Qualcomm's 14nm process, which provides it with noticeable performance and efficiency gains over earlier chips. For example, Qualcomm says the 450 delivers four more hours of battery life when compared to the Snapdragon 435, and 25% faster CPU and graphics performance thanks to the paired Adreno 506 GPU. 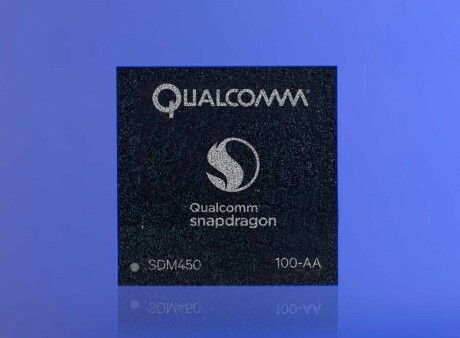 The Snapdragon 450 uses eight 64-bit ARM Cortex A53 cores clocked at up to 1.8 GHz. Qualcomm said market timing and availability prevented it from selecting ARM's newer A55 core for the 450. The CPU and GPU improvement deliver an average 10-15% reduced launch latency for mobile apps, quicker 3D graphics rendering, and full HD+ playback on smartphone displays. The Snapdragon 450 supports Qualcomm's X9 modem (Cat 6 LTE), which translates to download speeds up to 300 Mbps with 2x20 carrier aggregation and 64QAM. The improved Hexagon DSP and Aqstic Audio processing make the Snapdragon 450 a better option for media-focused handsets. For example, the 450 can support up to two 13-megapixel cameras for bokeh effects and real-time exposure/color measurements, or a single camera up to 21 megapixels. Video capture has been improved to 1080p at up to 60 frames per second, and the 450 allows for audio zoom when the camcorder is zoomed in. The Hexagon DSP also makes it possible for phones with the Snapdragon 450 to support iris-based biometric authentication — a first for the Snapdragon 400 family. Other features supported by the Snapdragon 450 include Quick Charge 3.0, advanced power management, fingerprint sensors, high-quality audio codecs, and powerful speaker amplifiers. Qualcomm said the Snapdragon 450 Platform will begin sampling during the third quarter and it expects the processor to reach consumer devices before the end of the year. Qualcomm today fully revealed the Snapdragon 855 mobile platform, its top-tier system-on-a-chip heading into 2019. Qualcomm focus on a number of pillars when developing this SoC, including performance, connectivity, AI, camera, and entertainment. Qualcomm today announced the Snapdragon 660 and Snapdragon 630 mobile platforms, two new systems-on-a-chip that the company says will dramatically improve speed, battery life, and photography for sub-flagship smartphones. The Snapdragon 660 succeeds the 653, while the 630 succeeds the 626. Qualcomm today announced the Snapdragon 845 mobile platform, its flagship system-on-a-chip for 2018. Qualcomm expects the module to form the core of next year's top smartphones, which it will endow with multimedia smarts for both audio and video.